It is common to see people excel in certain traits, during certain times and under certain conditions but to see someone excel over nearly 4 decades and beyond is rare and unheard of. This rare feat is achieved by Rafi Sahab in the art of playback singing. From his first assignment in early 40’s to his last in July 1980, one sees a career that remains unmatched and uncompleted to date. Rafi Sahab is not only a singer but an institution – a gharana that is now called the “Rafi Gharana”. Legend of legends: It was Mukesh, Mana dey, Hemant Da and Talat in 50’s – but Rafi Sahab made a permanent mark in that era. It was Mukesh , Mana Dey and Mahendra Kapoor in 60’s but Rafi Sahab became an inspiration for these great legends and it was Kishore and Yesudas in the 70’s but Rafi Sahab kept on surprising us and raising the benchmark of singing. Rafi Sahab proved that he was the uncrowned king of singing, what come may and such was the impression he made in his so called quiet years that the music charts in August and September of 1980 had him with more songs on the top of the charts compared to all other singers, male and female. Mana dey once said: “I could sing classical songs more proficiently than anyone else but when Rafi sang classical compositions, he sang in a way that could relate to a wider audience rather than the ones who only liked classical songs. His presentation of the song was more superior to mine and I have no shame in accepting that he was the best in his art. Whatever he sang became a part of the Rafi Gharana“. How apt are the comments of the legendry Mana Dey. Rafi sahab was a born singer who continuously excelled and raised the bar so high that he became an inspiration not only for future singers but also his colleagues and co-singers. Rafi sahab attained the status of a legend by the 60’s and by 70’s he was and is still considered the greatest singer in HFM. Fans of a certain artiste always believe that their icon is the best but with Rafi sahab this is not the case. Fans of Rafi Sahab do not have to prove the greatness of the emperor for his achievements speak for themselves. Whether it is Talat Mahmood, Hemant Kumar, GM Durrani, Mukesh, Kishore, Mahendra Kapoor, Shailendra, Yesudas, Sonu Nigam, Shabbir Kumar, S Balasubramanium, Lata, Hemant Kumar, Udit Narayan and others, all consider him a benchmark . When songs of singing legends swear by the unmatched greatness of Rafi Sahab: What kind of admiration and respect these legends had and have for Rafi Sahab are well documented. Whether its Mukesh insisting Nitin to sing the songs of Rafi sahab and not him in the shows or when Jayanto, son of the legendry Hemant Kumar says that Rafi sahab is the best singer of all times is a testimony of the true greatness of Rafi sahab. Every son or daughter would always believe their parents are the best in their work but for Nitin and Jayanto to say this is an example of the respect and admiration And Kishore Kumar a self professed Rafi Sahab fan who accepted with grace in the 70’s that Rafi Sahab could sing a song in 100 ways what he (Kishore) could sing in one. Sadly today some naïve people compare the bhakt (Kishore) with the master (Rafi sahab). It is said, it is easier to remain on the top but hard to maintain it. Well Rafi sahab proved this statement wrong by setting and maintaining lofty standards over 35 years. In a competitive industry dominated by politics, this simple and gem of a person managed to reign supreme for so long, simply amazing!!. Commercial success meant nothing for him, he always tried to compete with himself and no wonder his skills remain unmatched to date and I don’t think it can ever be equaled. It did not matter for whom who was the MD and how much he was to be paid for a song, all that mattered for him was the quality he had to offer the song. It is a miracle that God should have bestowed such rare and unmatched talents to a person who was not only the greatest singer of all times but also a very kind and noble human who never took advantage of his popularity. When SP Balasubramanium yelled “impossible” : SP Bala Subramanian an esteemed singer and a legend in his own right believes that Rafi Sahab was unique and cannot be matched by anyone which in my view is an understatement; When SPB was speaking of one of the eternal renditions of Rafi Sahab “O Duniya Ke Rakwaaley” , on a TV program, just as the songs ends SPB screams “impossible”. Impossible for anyone to sing in the manner Rafi sahab could. It’s a known fact in industry that Rafi Sahab ruled high pitch and there is no male singer better in switching notes so easily. There are artists who can go beyond but then they sound strained or they don’t have pleasant voices when they venture into those territories. The voice and singing of Rafi Sahab is just perfect. The miracle song of Brahmachari: When Rafi sahab sang Dil Ke Jharoke mein from film Brahmachari his range and pitch went where no singer would ever dare to go. The song was initially composed to be sung at a single range however the song required to express the feelings of a broken heart hero in the film and Rafi sahab with SJ decided to have it done with multiple range which would require Rafi sahab to sing literally with very little breathing. 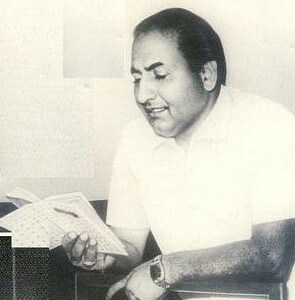 The song was recorded and Rafi sahab reached twice the range as originally decided. He sang the first verse at a low pitch and then took the same at four different range levels, a feat that is impossible to achieve unless the singer breathes heavily. Hear the song in the cleanest version and I bet you can’t hear any breathing whatsoever. All in the recording room became cold and the news spread about the song. Many well wishes including singers and MD’s were upset when they heard the song and called Rafi sahab and asked him to promise that he would not never attempt any think like this in future as it could have harmed his health. People who have good knowledge of playback singing can tell you why this song is impossible to sing the way Rafi sahab did but they will also tell you that only Rafi sahab could do it. The winning rendition in Barsaat Ki Raat: As we all know Roshan sahab was the MD and Sahir the song writer of the evergreen qawali “na tho caravan Ki talash hai”. When Roshan finished the composition he called Mana Da to sing for the Ustad who was singing in the film and said, Mana you must sound like an Ustaad as you are singing for one in the film. Roshan then called Rafi sahab and said, you will sing for Bharat Bhushan who wins the qawali competition in the film from a position where his group appear loosing. Rafi sahab knew exactly what Roshan meant. Rafi sahab picks up the song in a way that cannot be described in words, no one could ever match this , whether classical singers or thumri experts or any one. The alaap he starts his part is mind boggling and the lines he sings after it can’t be described by mere words. After the recording Roshan approached Rafi sahab and said, you won, you sang in a way that any Ustad would loose. Rafi sahab knew that he had to sound like a winner and he produced this mastery rendition of unmatched and un- measurable proportions and met the demands of the script. It was the year 1973 when Rafi Sahab had began recording after an absence of about 18 months or so as he had decided to give up singing for religious reasons. The title song of Ek Mahal Ho `Sapon Ka was originally recorded by legendry singers Lata and Kishore. After the song was recorded, the producer asked Ravi to get it recorded in Rafi sahab’s voice for reasons best known to him. Mind you the year is 73, a period which is linked to the dry period of Rafi sahab in terms of his output not the quality. One really wonders ” how is it possible that a singer that is at the prime of his popularity as a singer (Kishore ) can be replaced after the song had being recorded by a singer who was so was so called eclipsed by Kishore in that period. This incident is just one of many that dispel these myths. Competition was nothing new to Rafi Sahab and as discussed above he had to compete with many distinguishes singers over the 4 decades but in terms of quality, he had no competition. Overcoming bias, politics and factionalism: For any fair competition there must be an equal playing field. In 40’s, 50’ and 60’s, even though Rafi sahab was considered the best singer in most of this period, other singers had equal opportunity. The 70’s was different though. There was a clear bias and an unfair playing field with certain music directors making it their personal passion and aim to back only one singer in a rigid manner without considering the nuances of the songs. Even in such unfair times, Rafi sahab kept on increasing the benchmark by memorable renditions. A highly regarded music critic once told me that no singer male or female has sung half as many great songs as Rafi sahab has and that as per him every song of Rafi sahab sung in 70’s was equal to 10 songs sung by others in that era. A musician for Laxmikant Pyarelal once told me that when recording “ Aaj mausam Bada” from Loafer in 73, he and others in the orchestra felt that this one song overshadowed all the songs released in 73 of all other singers and should have got unanimously at least a film fare award. Rafi sahab, the true legend as he was and is gave a resounding slap to all these biased elements and politicians of the music world when he got the national award in the 70’s and when he had more songs on the top of the charts than any other singer in the year in which he left us. Such was his unmatched persona and presence that even his physical absence could not stop the unmatched greatness of his everlasting singing that reigns supreme to date and will always reign supreme forever. After Rafi Sahab left us, there was As if a famine in the “world of quality singing” that sadly exists to date. Music directors became so desperate and anxious that they looked for any singer that could sound a bit like Rafi sahab. It became a mockery, music world was left in ruins and the only fragrance left was the memory of Rafi sahab and the songs that he has left behind for us and the coming generations to hear and cherish forever. Bias and mischievous people tried to take the great man out of the recording room but could not take him out of our hearts. Like always Rafi sahab had the last say. This entry was posted on Sunday, July 1st, 2012 at 2:59 pm	and is filed under Meri Awaaz Suno. You can follow any responses to this entry through the RSS 2.0 feed. You can leave a response, or trackback from your own site. No One can deny the reality of Rafi Sahebs’ superiority in the Music- dom except Narrow Minded. What a great article and I totally agree that all the respect, love and admiration mohd rafisahab has from his millions of fans is one thing but to earn that kind of respect from his contemporaries and fellow artists is another. No one has or will ever be able to achieve the heights of popularity as he has because no one has that talent, versatility or ability to touch the hearts of millions of people in the same way mohd rafisahab has. So many years have gone by and even with the population india has, there has been no one who has been able to even come close to the great mohd rafisahab. It fills me with joy to know that new generations of people are enjoying his beautiful singing and his fan base is increasing all the time because it would be a travesty if the so called music of today was the only music youngsters were familiar with. Everybody knows that rafi saab was the greatest singer of all time. In one interview lataji herself says that I was honoured to sing with rafi saab. He was true gentleman with extremely pure heart. And this purity you can SEE in his singing. .What a man what a singer WOW. No other singer any where near to him.He was an institution of playback singing. Nearly 32 years has been passed but RAFIANS increasing every second. rafi saab is just like a “super market”.he is the super singer also. emotion or whatever the situation asking for etc.etc……………. to fulfil all these and keep the personality in a divine manner!!!!!!!! who is there for the entire world to replace rafi saab? jharo ke mein tujko bita kar, etc.etc.did not hear again. v o i c e ……………. Music Expert Dr. Mukesh Garg said that Rafi’s popularity is increasing with time & he has defied age. Singer Priyamvada Vashisht, daughter of music director Husan Lal (of Husan Lal-Bhagat Ram fame) said that Rafi’s range was matchless. She said Rafi’s song “Suno suno ai duniya walo, bapu ji ki amar kahani” composed by her father Husan Lal after the death of Mahatma Gandhi, had become a rage in those times.